Friday, April 4, 2014 at 6:00 p.m.: Screening starts and doors close promptly at 6:10 p.m. The film is 71 minutes. Please purchase below online (credit card or PayPal). Or, download this form and send your check payable to the American Scandinavian Society to Ritva Metso, 400 East 85th Street, New York, NY 10028 by April 1. 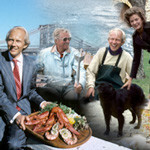 $67.00: Film screening followed by Cocktails and Buffet Dinner at Paavo’s apartment in South Street Seaport SOLD OUT!! Note: You will not receive a ticket for the theater, but your name will be on the guest list. If you are purchasing more than one ticket, please add the name(s) of your guest(s) in the “Additional information (optional)” field on the checkout screen. Please book early. Cocktail reception and dinner is donated by Paavo. Net proceeds to benefit Cultural Programs of the A.S.S. A film about friendship, loyalty and bonds. Touching, but also full of funny moments. The audience at Scandinavian Film Festival L.A. loved this film. Some came because they loved Ingrid Bergman. And they all left loving Paavo and embracing life just a little more. 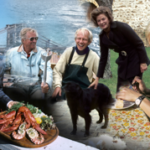 A sumptuous feast for the eye and the heart, PAAVO-A LIFE IN FIVE COURSES is a magnificent film that documents the extraordinary life of a gifted man whose culinary genius and supreme good taste have brought sustained joy into the lives of many people. Paavo’s notable events include Isabella Rossellini’s 3-day “Manifesto” perfume launch in Stockholm, Sweden for 220 international fashion editors; the opening dinner of the new Finnish Embassy building in Washington DC hosted by Finnish President Martti Ahtisaari; a cocktail reception and dinner by Queen Noor of Jordan; the annual gala reception for exhibits at the Alexander S Onassis Foundation Cultural Center; a cocktail reception for Senator Barack Obama; the Finnish Food Week at the Hotel Intercontinental in New York; a cocktail reception at the United Nations building hosted by Swedish Prime Minister Göran Persson; a cocktail reception for Vice President Richard Cheney, and annual dinners for prime ministers and foreign ministers during the United Nations Security Council meetings. He has planned and produced events not only in the Tristate area, but also in California, Washington state, North Dakota, Washington DC, France, United Kingdom, Switzerland, Sweden and Finland.